In observation of the National Health Insurance Month this February, Philhealth XII had its press conference after the First Friday Mass and inauguration of its new Local Health Insurance Office Koronadal on February 7, 2014. Said activity attended by the local media and Information Officers and IO designates of difference government agencies initially tackled issues on Philhealth bonuses. OIC Chief Operating Officer and Area Vice President for Philhealth Mindanao, Ramon F. Aristoza, Jr. said that what Philhealth employees received is bounded by law and this issue raised by the Commission on Audit is already at the Supreme Court. As stressed in the official statement issued by the corporation, Aristoza explained that Philhealth law authorizes the Corporation “to organize its office, fix the compensation of and appoint personnel as may be deemed necessary and upon the recommendation of the President of the Corporation” (Sec 16n, RA7875 as amended) Moreover, said allowances and incentives did get Presidential approval way back in 2007. “There were 5,800 officers and employees who have benefited from such and not only a few or selected individuals. Several of those benefits, allowances and incentives were sanctioned by Magna Carta for Health Workers and various Collective Negotiation Agreements (CNA) entered into and between Philhealth Management and its union,” Aristoza added. Asked if the COO is with the policy makers in crafting said bonuses for employees, Aristoza answered that he assumed only his position last year, long after said law was implemented. Koronadal City Information Officer, Salvacion Manato asking about the total number of coverage sponsored by the City Government for 2013 while the rest of the audience listened and waited for the answer from the panelists. Nathan Delgado of RMN Koronadal further asked about how did the corporation deal with the self-employed and voluntary members’ contribution that was not utilized for their admission. As a socialized institution where young subsidizing the old, rich subsidizing the poor, healthy subsidizing the sick, Aristoza answered that said members’ contribution is pooled in the trust fund for every member’s admission. Aristoza further stressed that as of October 2013, Philhealth paid a total of Php45.2 B benefits for the members and collected only Php44 B during the same period. OWWA Labor Communications Officer, Giovanni Gibson B. Docusin on the other hand thanked Philhealth for a hundred thousand benefits he availed from a four hundred thousand bill he had last year in exchange of his one thousand eight hundred 2013 annual contribution. In addition, he asked Philhealth to provide again personnel who will facilitate OFW’s enrolment in their one-stop-shop at OWWA XII. OIC Regional Vice President, Miriam Grace G. Pamonag thanked Docusin and OIC Field Operations Division Chief, Lorelie G. Bonilla committed to provide one Philhealth representative as soon as the online system is again in place to facilitate immediate enrolment. “May we know if whom could we refer faster hospitalization reimbursement for the uniformed personnel?” NAPOLCOM12 PR Officer, Bryan Bingil asked. Health Care Delivery Management Division Chief, Edson F. Pama answered that it could be referred to the Benefits Administration Head, Henry Manzares and said claims will be processed immediately and accordingly once all necessary documents are attached such as official receipts, clinical charts and properly filled out claim form 1. Pama also explained the rules of availment for TSEKAP of sponsored, indigents, Dep-Ed personnel, organized group gold members and Z benefits for all with DAR12 PR Officer, Ma. Theresa Quimsing. The difference between 100K for prostate and 120-175K for cervical cancer does not mean that Philhealth executes gender inequality in terms of benefit provision for said packages because said cases were studied prior to their launching Pama explained to TESDA PR Officer. Rolly Palencia. 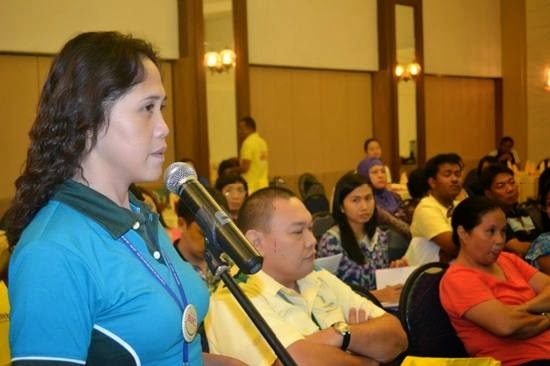 With the new benefits and packages launched by Philhealth and amended Implementing Rules and Regulations, LGU Surallah PR Officer, Gennie Parreño suggested to relay the same information through their radio program in Surallah, South Cotabato. DENR 12 PR Officer, Marilyn Decierto likewise suggested to include indigenous people of Tampakan in the group enrolment for they too are susceptible to illnesses and infection of animal bites. Pamonag accepted the proposals and Bonilla referred the group enrolment to Joy S. Lizada, point person for organized group in the Region and the later discussed off the phone the procedures and requirements with Decierto. All other issues on membership coverage and enrollment, benefit availment procedures were further answered by the panelists.